War casts a shadow over the land dragons once ruled. Only the courage of a young woman with the mind of a gambler and loyalty to no one stands between hope and universal darkness. An age of madness and death approaches, with only a few doomed heroes to stand in its way. And a jaded mercenary and renegade priest begin a terrible journey with an impossible goal: destroy a goddess before she eats the world. 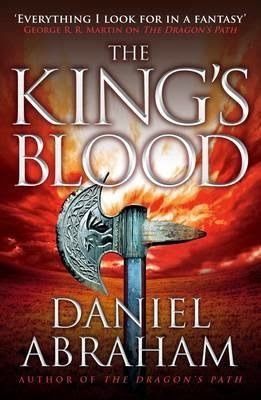 The King’s Blood is the second book in Abraham’s Dagger and Coin series, and it follows on nicely from the events of The Dragon’s Path. Our favourite characters – Marcus Wester, Cithrin, Dawson, Clara, Geder – return to carry on the story, which takes a somewhat darker turn here than in the first book. I have to say, I’m really enjoying what I’ve read of this series so far. I’ll start by saying that the blurb is a little misleading: the ‘young woman’ it mentions (Cithrin the banker) is still an important character in The King’s Blood, but, aside from in one particular instance, she isn’t a hugely pivotal part of the story. Instead, the central plot follows a city’s gradual descent into civil war, which we see from two main PoVs, each on a different side of the conflict. These two characters (who will remain unnamed for spoiler purposes) are really well-written: in The Dragon’s Path they were both likeable for different reasons, whereas now we’re presented with a different side to them. Both have their reasons for doing what they do, but it’s difficult to decide which is right and which is wrong. A much darker tone is layered over the story by the ambiguity of the characters and the fallout from their decisions, and I think it sets up the rest of the series brilliantly. One of my favourite POV characters is Clara Kalliam, who receives a lot more page time here than in the first book. Clara is the middle-aged wife of Dawson Kalliam and mother to four children, whose main purpose is maintaining the house and participating in social events with other wives of the rich and powerful. This doesn’t sound like the makings of an interesting character, but in reality it’s a breath of fresh air from the morally ambiguous mercenaries and barbarians and thieves and soldiers that populate (and dominate) so much of modern fantasy. She has a unique perspective on events; she’s a very brave and sympathetic character, and the way she deals with her trials and tribulations while still remaining gracious is lovely to read about. She’s the only character I can say I’m 100% rooting for, especially as she appears to have put a bit of steel in her spine by the end of this book: I’m particularly looking forward to seeing what she does next. The other main plotline, of course, is that of Marcus (the ‘jaded mercenary’) and Kit (the ‘renegade priest’), who have just embarked on a quest to find a magic sword and kill an evil goddess. Agreed, this sounds like the clichéd plot of an old role-playing game: but somehow, we don’t mind, probably because we want to see these two cool characters paired up on a wild adventure. The fact that Abraham acknowledges the cliché with a few dry remarks from Marcus just makes us wonder how he’s going to mess around with our expectations, and personally I can’t wait to see if and how he does it. Everyone says that The Long Price Quartet got better with each book, and while I loved the whole series I understood where they came from. But this series truly is following that path. The first was pretty generic, yet good, but they are getting better and better.